The Fourth of July is the premier American summer holiday and the day is filled with family, friends, fun, food, and fireworks. Of course, every great party needs a fabulous drink or two and there is no shortage of refreshing cocktails for your patriotic soiree. Perfectly patriotic, the American Dream is a delightful and festive cocktail that's ideal for any Fourth of July party. While the beverage itself is tempting, it is the fondant stars inside the glass that bring it over the top. The fruity martini-like cocktail includes a pomegranate liqueur, black cherry rum, and pomegranate-cherry juice. 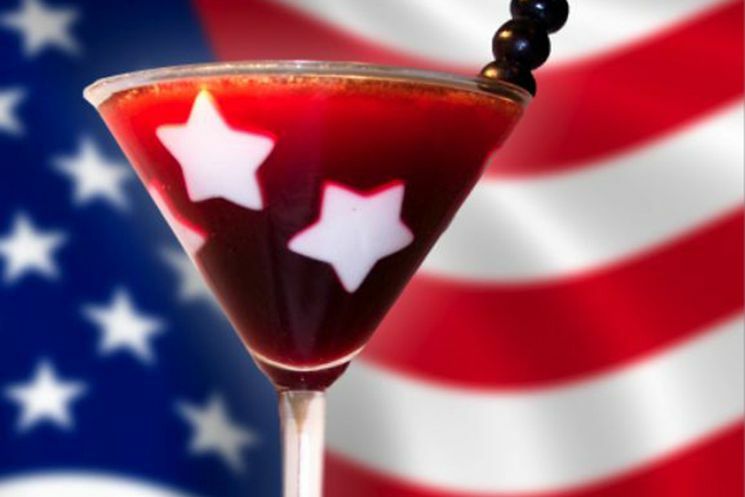 This red background offsets the white star decoration, making it a picture perfect cocktail. The Tom Collins is a fantastic cocktail and a favorite for many gin devotees. Let's take that to a new level for the Fourth and mix up the berrylicious American Collins. This simple recipe is just like the other collins, with a fine gin, hints of syrup and lemon, and club soda for sparkle. You'll kick it all off by muddling fresh blueberries and cherries to bring in the flavors of summer and transform the drink into a colorful libation. A fun mix with a little surprise inside, you're going to enjoy this fruit-filled highball that is packed with flavor. It's a unique taste, but one that's sure to impress. The Broad Stripes and Bright Stars starts off with fresh blueberries and a blueberry vodka. A hint of absinthe adds a nice contrast and the drizzle of sweet raspberry liqueur offsets the snap of a good ginger beer. Maybe a shooter is more your style. 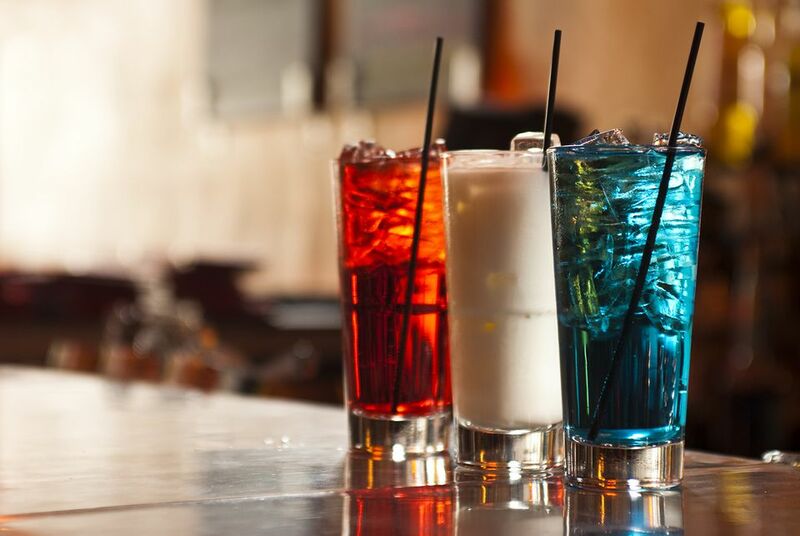 Kick off the party with a Red, White, and Blue shot and show off your bartending skills at the same time. This is a popular recipe that's very easy to make. There's no mixing involved, either. You'll simply create stripes in the glass by layering grenadine, peach schnapps, and grenadine. It's fun, sweet, and very smooth as it goes down. Simple, tasty, and possibly a little too much fun, the UV Liberty is a cocktail you won't want to miss. This brilliantly blue drink requires just three ingredients and it's a great option for the backyard barbecue. Think of this as a blue vodka float. It features that tempting raspberry-flavored vodka, UV Blue, over a scoop of raspberry sherbet. Top it off with a lemon-lime soda and a delicious treat is yours to share and enjoy. We cannot host a summer soiree without a Mojito, now can we? If you're looking for the ultimate celebration of all things that make summer great, the Independence Day Mojito is a perfect choice. For this recipe, we're building off the sweetened rum, lime, and mint that make Mojitos spectacular. All you need is a few cubes of watermelon and a handful of raspberries. Muddle it, mix it up, and sip away. It's both easy and refreshing and you'll quickly fall for this stunning vodka highball. The blue color is just part of the appeal and it is all thanks to the liqueur we know as Hpnotiq. The Air Force One recipe uses a citrus vodka along with Hpnotiq and a splash of lemon. The only other ingredient required is your favorite lemon-lime soda, so mixing this one up takes no time at all and you can get back to the fireworks. It's a modern recipe, yet it's made in classic cocktail style. The Lady Liberty holds a fantastic array of flavors and it's sure to please even the pickiest of palates. The cocktail has a tiki-like start, complete with light rum and orgeat syrup. From there it dives into your liqueur stash, requiring maraschino, Green Chartreuse, and a hint of absinthe. If you're seeking a new taste for the Fourth, this recipe is flawless. We'll finish off our colorful cocktail collection with a twist on another favorite drink of summer, the Mint Julep. Whiskey lovers will be fascinated by this recipe and it's just as easy to mix up as any other. The key here is the peachy flavor, which comes from fresh white peaches, peach liqueur, and peach bitters. Set that against the irresistible bourbon-mint background and the best party of the summer is underway.